TOP OF FIRST HOUR NEWS: Thur., Mar. 21, 2019 — Women’s Forum TONIGHT at 7pm, at BOND in Los Angeles. Current location 6146 W Pico Blvd, meters are free after 6pm. Preparations were underway for a massive so-called “prayer service” to be held Friday, with nearly 4,000 people expected to attend. 400 Migrants Apprehended in Five Minutes… (Breitbart) El Paso Sector Border Patrol agents apprehended two large groups of Central American migrants after they illegally crossed the border from Mexico. Agents apprehended the two groups totaling more than 400 during a five-minute period early Tuesday. (Drudge) Kellyanne Sides With President Over Spouse… (Mediaite) “He left it alone for months out of respect for me,” Conway, a senior Trump aide, told POLITICO in a brief telephone interview. “But you think he shouldn’t respond when somebody, a non-medical professional accuses him of having a mental disorder? You think he should just take that sitting down?” Yesterday afternoon, Trump bashed George Conway again––calling him a “whack job”—minutes before the Politico piece dropped. Jacinda Ardern, PM of NZ, is going for your guns in her country. TOP OF SECOND HOUR NEWS: Thur., Mar. 21, 2019 — Women’s Forum TONIGHT at 7pm, at BOND in Los Angeles. He said “I’ve been talking about problems that affect truck drivers, the opioid epidemic that’s killing Americans in many communities.” He says he’s against racism. He says “economic insecurity can fuel a mindset of scarcity that then helps lead to xenophobia and racism and hatred…” but “the ‘Freedom Dividend’ of $1,000 per month might actually help make people more reasonable and generous and accepting.” He claims it’s not immigrants, it’s automation, taking people’s jobs. Yang also Wants Penalties For 'Fake News'... (Daily Caller) Yang promises the federal government will punish media companies pushing “misinformation,” but he says “we should face the reality that fake news and misinformation spread via social media threatens to undermine our democracy and may make it impossible for citizens to make informed decisions on a shared set of facts.” He called out “Russia” in particular as intending to do harm. (Drudge) Media Investigative FOIA Requests Jump 669% Since Obama Left… (All of a sudden they’re soo interested in “journalism” and “questioning authority.” (Wash. Free Beacon) Media FOIA (Freedom Of Information Act) requests to the EPA (so-called Environmental Protection Agency — a misnomer) Spiked After Trump Election, Data Reveal. Outlets such as NYT, WaPo grew FOIA-happy immediately after Trump took office. Reporters at the Times have made 100 FOIA requests since Trump took office just over two years ago, a 669 percent increase of the number of FOIA requests it made during Obama's last four years. Reporters at the Washington Post sent just a single FOIA request to the EPA during Obama's entire second term, and have sent 43 FOIA requests to the agency since Trump took office. Similar stories with ABC News, CNN, Politico, The Hill…. So NOW they want to scrutinize the president. 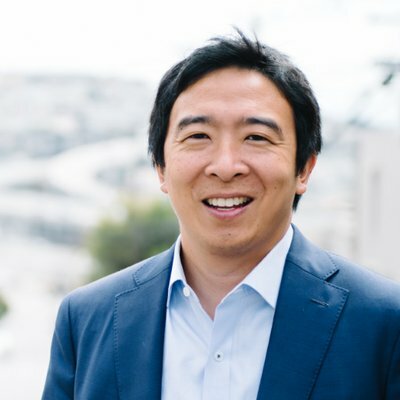 Andrew Yang’s Twitter profile pic. He wants to give away free money. TOP OF THIRD HOUR NEWS: Thur., Mar. 21, 2019 — Women’s Forum TONIGHT, 7pm at BOND in Los Angeles, CA. Women’s Forums 3rd Thursday for ladies only. Men’s Forums 1st Thursday for men only. (Drudge) Police investigate woman who misgendered trans in tweets… (The Telegraph) Devout Catholic 'who used wrong pronoun to describe transgender girl' to be interviewed by police. Caroline Farrow, a Catholic commentator, and transgender rights campaigner Susie Green, agreed to take part in a television debate about a controversial Girl Guides policy. They continued the debate on Twitter which resulted in a six-month-long police investigation. Mrs Farrow, a mother of five with strong religious views, allegedly used the wrong pronoun when referring to Ms Green's transgender daughter. Ms. Green was so angered by what she described as a “distressing and spiteful” attack that she filed a formal complaint with Surrey police. Amazing. Also, FYI: Making jokes at Portland State University gets you reported to its bias response team… (The College Fix) Two bias reports filed at the public institution last fall were against people making jokes or similar off-hand comments on campus, per findings of a public records act request. According to the university’s website, “Any person who has experienced, witnessed, or heard of a bias incident” is encouraged to file a complaint electronically.